VuuPC promotes itself as a useful remote desktop client that can connect your computers and remote devices as long as they are connected to the Internet. At the first sight, it seems to be a useful application that can help you access your main data anytime you want. However, computer users often complain that VuuPC exposes them to potential threats. Even our security research team strongly recommends removing VuuPC from your system, because this application does not have a good reputation, and you should not risk the possibility of a third-party exploitation when it comes to your personal data. If you have not downloaded VuuPC via vuupc.com, you most probably are wondering how this application managed to enter your PC. The answer is – bundled downloads. A lot of users complain that this program often moves around bundled with other freeware apps, such as AnyProtect that is also a potentially unwanted application. 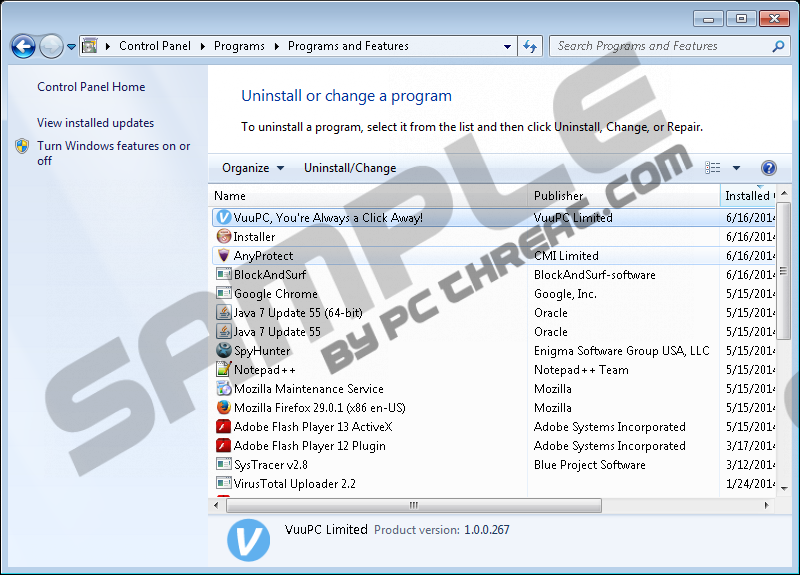 Even if you had no intention on installing VuuPC onto your PC, this and similar programs are set up on your system by default when you initialize freeware installation. The next thing you know is that VuuPC and similar unwanted programs are running on your PC, and you have to deal with that. For the most part, users can choose NOT to install unwanted applications on their systems even when they install freeware. Such options are often included into third-party installer. If user reads all the setup steps carefully, it is possible to avoid installing VuuPC. However, if you skip all the installation steps just to get to the end as soon as possible, chances are that you will have a list of unwanted programs installed on your PC in no time. After the installation, VuuPC adds an entry into Windows Registry that allows it to auto-start each time you turn on your computer. Officially this program says that with VuuPC running on your computer and your mobile devices, you can “work on your PC from any internet computer or mobile.” However, based on our research, most of its files are not clean, and it could be exploited by cybercriminals to gain access to your computer. It is not a good idea to keep an unreliable program on your computer. Luckily, manual VuuPC removal is not complicated, and you can uninstall the application via Control Panel. That does not mean, however, that it all ends here. You should also run a full system scan with SpyHunter free scanner to check for other unwanted programs, because (as it has been established already) VuuPC travels bundled with other apps. Terminate all the potentially dangerous applications and safeguard your system against similar threats in the future. Open Uninstall a program and remove VuuPC, You’re Always a Click Away. Select Uninstall a program and remove VuuPC, You’re Always a Click Away. Uninstall VuuPC, You’re Always a Click Away. Quick & tested solution for VuuPC removal. Removing it is easy, how to I stop it from installing itself again with my permission? This VUUPC is in your registry somewhere and you need to get someone to fix it for you. Downloading all these spyware and malware protection programs might help you just make sure you are going to pay for the program. I have the same thing happen to me and VUUPC keeps on downloading itself in my computer on its own without my permission. So take it to someone to get fixed it is worth it. On windows 10 insider, you cant MANUALLY uninstall it, nor , I guess, non manually. I've tried programs like TweakNow regCleaner but that just gives me an error message, any idead?